Full 1080p resolution, image stabilization and extras like an external microphone jack make Kodak’s Zi8 the most potent mini HD camcorder available today. 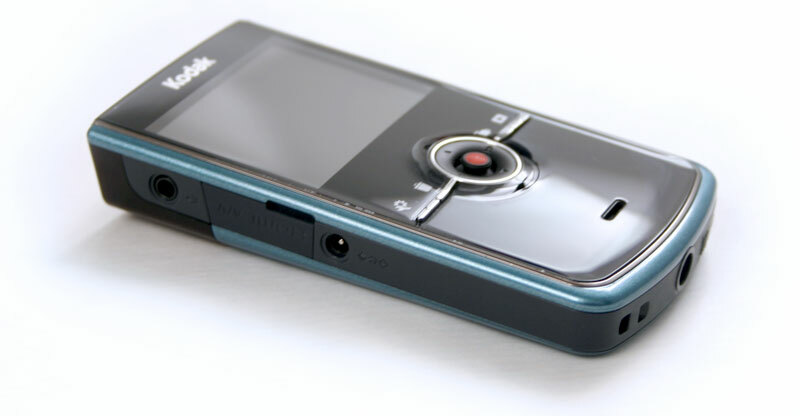 Although our first mini HD camcorder rodeo roundup crowned Cisco’s Flip UltraHD the reigning king of mini HD camcorders, six months can make a world of difference. Kodak’s new Zi8 bucks the leader by addressing many of its predecessor’s shortcomings, while systematically outdoing the competition on just about every feature. 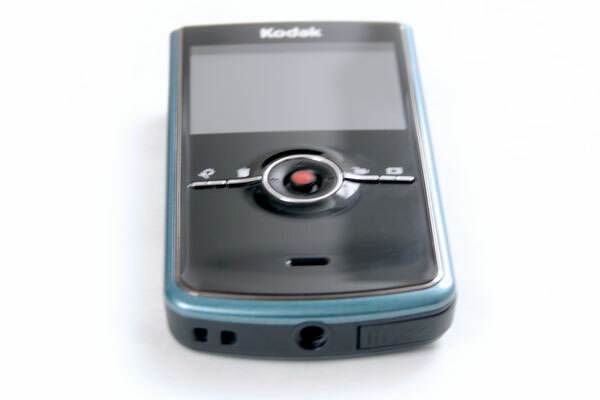 Combined with a reasonable $180 price tag, Kodak’s Zi8 now confidently struts it stuff as king of the ring. While Flip’s MinoHD and UltraHD still offer a slightly smaller footprint than Kodak’s 2.4-inch by 4.5-inch Zi8, Kodak offers more than enough features to justify the extra bulk. Like the old Zi6, it will shoot 720p HD footage at an extra-fluid 60 frames per second, but also adds full 1080p to the slate for 1920 x 1080 footage at 30 frames per second (not 1440 x 1080 as Sony’s allegedly 1080p Webbie shoots). The chunky AA batteries from the Zi6 disappear in favor of a removable lithium-ion unit, but the SHDC slot remains in place of dedicated, built-in memory. 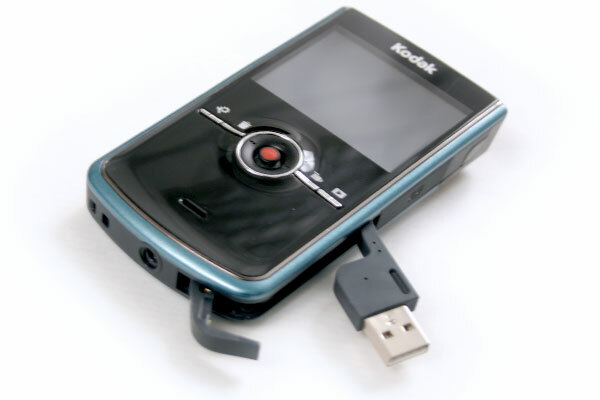 Kodak has also added an external microphone input jack for recording better audio, and electronic image stabilization for attempting to eliminate the shakes that come from such a tiny cam. The screen spans 2.5 inches, giving it a leg up on the 2.0-inch screen on the Flip MinoHD. Like almost all cameras in this category, you’ll find a screen and simple control scheme on the back, which uses four buttons and a standard five-way directional pad. A simple focus slider up top controls the shift from landscape to macro. The Zi8 has both an HDMI jack for outputting high-def video and a more conventional A/V jack for sending out SD content through composite cables. The colorful front door slides off to swap the batteries, while SD cards go in and out through the card slot on the right-hand side above its obligatory fold-out USB plug. Unlike many competing cams that conveniently charge via USB, you’ll need to charge the Zi8 with an included DC power adapter that plugs into a dedicated jack on the left-hand side. Travelers will find it inconvenient to lug one more brick around to keep it topped off. Kodak’s relatively generous accessory bundle includes a wrist lanyard, charger with removable cable, and most impressively, both HDMI and composite cables for TV viewing (pretty essential accessories that we can’t believe Flip neglected to include either one of with the second-gen MinoHD). The remote control somewhat deceptively pictured on the box would have made a nice addition for recording, but users who need it can get one for a relatively reasonable $13.